Wouldn’t it be great if printer inks were labeled the same as most food items – price per lb/kg, in addition to item price? Unfortunately, this is not the case with printer ink, so we must take other measures to figure out how to buy the cheapest ink, so to lower the cost of printing per page as much as possible. You might have noticed that inkjet printers are surprisingly cheap, often under $50. Well, that surprise vanishes when you understand that printer manufacturers use the ink pricing to recoup their “loss”. Over time they make more profit from selling printer ink than they would from selling actual printers. In short, the printer manufacturers are counting on you to view the ink cost as a necessary maintenance expenditure. Obviously, the only measure for ink cost efficiency is cost per printed page, but how do we calculate it? After all, a page can contain images, dense text, differently spaced paragraph text and differently spaced lines. All of these factors add up to widely different ink expenditures per page. As you see, we can only deal with approximations, or what the ink and printer manufacturers call a page yield per cartridge. Then, the phrase “up to” will be introduced before the actual number of pages, to account for inherent variability. For example, the ‘Epson DURABrite XL T127120 Ultra 127’ has a page yield of up to 945 pages, and the cost of the cartridge is $21.69. If we divide 21.69/945 we get $0.023 cost per page. When you know that value, it is now up to you to determine if that is acceptable or not, based on the amount of printing you will likely do, and based on the comparison of that ink cartridge with others. Of course, things get more complicated as some printers are more efficient in utilizing ink, and therefore more expensive, than others. Consequently, business/office printers are much more expensive than compact printers for personal use. 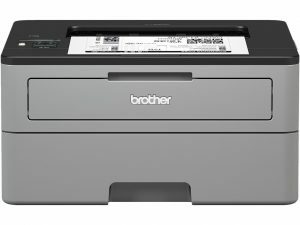 Laser printers, which use toners instead of ink, are particularly cost-effective for bulk printing. However, the most cost-saving measure of them all is – size. Just like with every food item you can buy, the more bulk volume it has, the less it costs per unit. With ink cartridges, you will often see the XL labeling for size. This means that it is high yield – offering about twice the page yield than regular cartridges. And finally, the price you pay for branding and guaranteed compatibility and quality. If you select third-party retailers who use remanufactured/recycled cartridges the saving could be enormous – up to 50%. Of course, this requires some research on your part to ensure full compatibility and that the quality of the ink is acceptable. Nonetheless, with Amazon’s review system in place this is not difficult to accomplish. As the knowledge of costly ink and cheap printers spread, the printer manufacturers responded accordingly, resulting in printer lineups specifically focused on cost-per-page effectiveness. 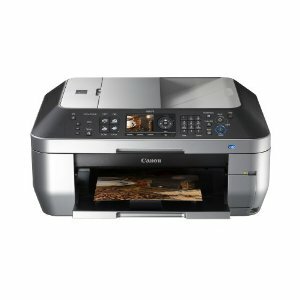 The Canon MegaTank Pixma series is one such lineup of five inkjet printers, ranging from the most expensive one – PIXMA G4210 MegaTank at $350, yielding up to 18000 pages (black), to the cheapest – PIXMA G1200 MegaTank at $271, yielding up to 6000 pages (black). All five in the MegaTank series yield the same for colored print – up to 7 000 pages. In addition, these printers ensure prolonged printing capability as one refill gets you the equivalent of 30 conventional ink cartridges. That’s where the moniker ‘MegaTank” comes in. Each one has a front-mounted reservoir that allows you to check the ink status at a glance. And the refilling ink is contained within bottles instead of regular cartridges, making the refilling procedure very convenient and quick. You will be happy to know that a complete 5 Refill Dye Ink Kit (135ml) costs only $14, so it would be safe to conclude that outside of laser printer category, this is as economic as you can get, and for personal use you would be set for years of printing. 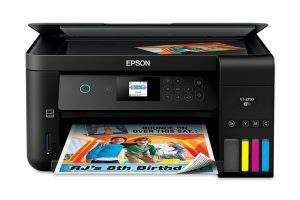 Mirroring the Canon Pixma MegaTank series, the Epson introduced the EcoTank lineup of inkjet printers. The EcoTank lineup actually consists of two series of printers – WorkForce and Expression – both of which have the ET labeling as part of the model name, which of course stands for EcoTank. The total number of EcoTank printers from Epson’s offer is 9, so you will have a wide range of options and price-ranges to choose from; starting from personal use and small office to serious business-oriented, multifunctional printers for high-throughput bulk printing. The Expression ET-2750 ($250) and WorkForce ET-4750 ($500) even come with 2 years’ worth of ink in the box. Like with Canon’s MegaTank, they are all designed for prolonged use without the need to refill, equivalent to 30 conventional ink cartridges. And just like with the MegaTank printers from Canon, 7 out of 9 have front-mounted ink reservoirs so you can always see their ink status. They also come with convenient ink bottles, so refilling them is effortless. However, the most commonly bought EcoTank refill kit is comparatively pricier at $23 (140ml), but this is somewhat compensated with higher colored page yield of 11200 pages compared to MegaTank’s 7000. Considered the best-value printer from the EcoTank series, and for a good reason – it comes with 2 years’ worth of ink, and the price for the printer itself holds at a reasonable $250. By ‘2 years of ink’ they mean a page yield capacity of up to 6500 pages black and 5200 pages color, both of which are equivalent to 30 conventional cartridges. That pretty much settles the printing cost-efficiency concern, so now we only have to look at other features. If anything is more bothersome when printing, it’s when you have to use software to set up printing on one side, and then manually set the pages so the other side is printed as well. The ET-2750 offers automatic two-sided printing, or as is most commonly referred to – duplex printing, so that worry also goes out the window. A 1.44″ color display, although not absolutely necessary, is an additional luxury feature offering an even smoother navigation and printing setup. Furthermore, the ink status is also independent of software as you can check with a glance all the clearly labeled and front-mounted ink reservoirs. This should become a standard for all inkjet printers, or at least those with large ink storage solutions. The printing and scanning quality is top-notch, and borderless photo-printing ensures further printing flexibility. And to top it all off, thanks to its WiFi capability, you can easily start printing from your iPad, iPhone, or any Android smartphone and tablet as well. 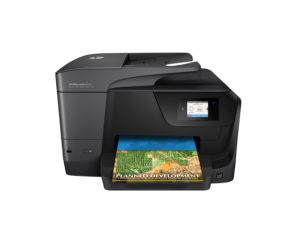 Offering a generous suite of handy options like duplex printing, wireless, touchscreen, copy, scan, and fax, this multifunctional printer comes at only $150, making it a bargain for any small office or personal desktop. However, keep in mind that, due to its scanning capability, it is rather large at 19.75 x 21 x 13.5 inches. The ink is included, yielding between 250 to 1500 pages, depending on the density of the content being printed, and the ADF (auto document feeder) can hold up to 50 pages, which is standard. Although it offers wireless functionality from smartphones and tablets, the software that ensures that functionality needs a lot of improvement in order to be intuitive, and that you can actually control the final output. As it stands, it requires a lot of tinkering. When you are dealing with multifunctional, all-in-one devices, you can’t expect that one of those functions – like printing – will offer premium quality. And Officejet Pro 8710 is no exception. For text printing it is adequate, but for printing even on a specialized photo paper, you should look elsewhere. After all, it is called Officejet, not Photojet, and the fast printing speed of 22ppm supports its main purpose – affordable, speedy versatility. Laser printers have 2-3 times higher cost-per-page efficiency compared to inkjet printers. Unfortunately, they are also much more expensive, except when you are dealing with monochromatic laser printers. So, if you are willing to forgo the ability to print anything in color, or you just don’t need colored prints, a monochromatic laser printer would be the best solution. In addition to being cost-effective, laser printers are also considerably quieter, don’t have warm-up time, and are drastically faster than inkjet printers. Fantastic 32 ppm speed, meaning less than 2 seconds per page! Most laser printers are quite bulky due to technology involved, but not this one. And despite its compact size, at only 14 x 14.2 x 7.2 inches, it still offers a massive 250-page load capacity (most inkjet printers can hold 50). Duplex – automatic two-sided printing. Wireless support for use with smartphones and tablets, both Android and iPhone/iPad. Widest range compatibility: Windows, Mac, Linux. The standard toner would yield you 1200 pages, while the more expensive high-yield toner will be enough for 3000 pages. However, with the Toner Save Mode on, you could significantly prolong the toner longevity. Like with any brand of products, besides paying for the product itself – its manufacturing and research cost – you also pay for the brand under which it is released. With printer inks and toners, the situation is further exacerbated because the manufacturers are marketing them as fully compatible and of highest quality, and they count on the maintenance aspect of printers to achieve additional profit. Some printer manufacturers go one step further to insure their profits by voiding warranty if third party parts/inks were used. With today’s omnipresent networking, the manufacturers may even be notified by your own printer in case you have used an aftermarket solution. In any case, thanks to Supreme Court ruling in Impression Products, Inc. v. Lexmark International, it is perfectly legal for third-party companies to refill ink/toner cartridges originally sold by a printer manufacturer. However, the quality of third party inks and toners can be of lower quality, but not by much. 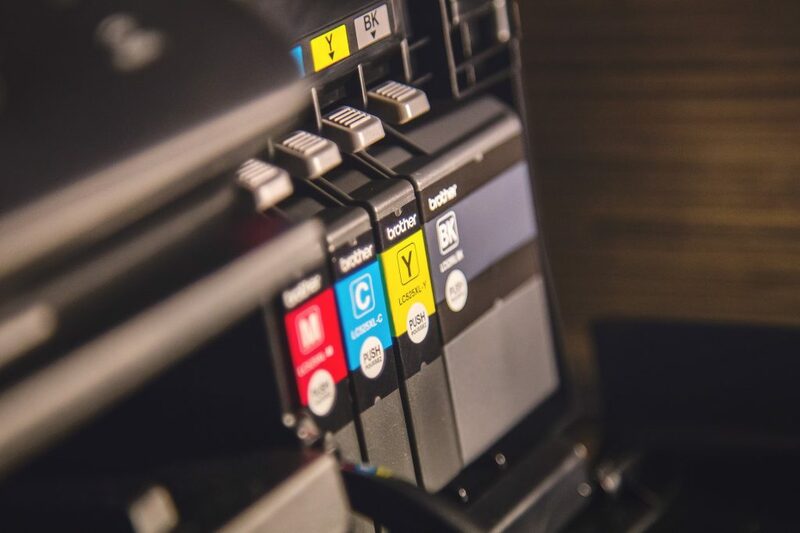 For instance, one Consumer Report survey determined that 63% of respondents were satisfied with aftermarket printer inks, unable to discern any difference from the name-brand cartridges. Which means that only 36% of respondents thought otherwise. 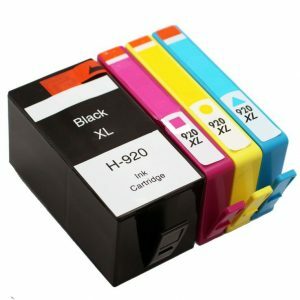 Thorough research on the third party ink that is compatible with your printer; what is the total rating of the product, and what do negative reviews say even if they are outnumbered by positive reviews? Find out if you can sign up for an ink-subscription service from the original manufacturer. 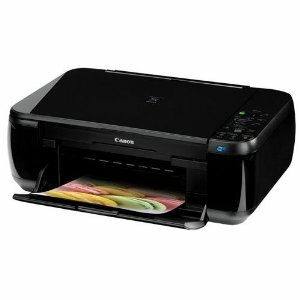 Consider buying a printer that is focused on ink efficiency, like the Canon MegaTank lineup or Epson’s EcoTank series. Without question, the most cost-saving solution when it comes to inkjet printers would be to buy one of the Canon’s MegaTanks or one of the Epson’s EcoTank printers, depending on additional functionality you need. On the other hand, if you are absolutely certain that you will never need colored printing, and no additional functions like scan or telefax, then a monochromatic laser printer would be your best bet. In addition to being super cost-effective for bulk printing, no inkjet printer could match laser printer’s speed and quiet operation.